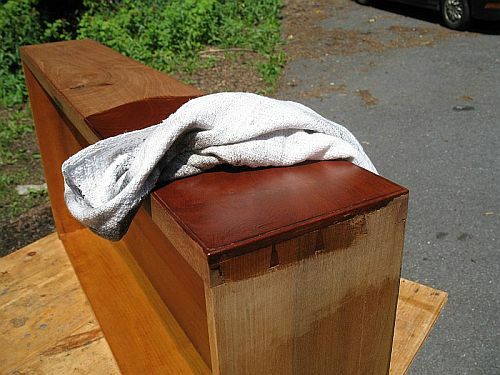 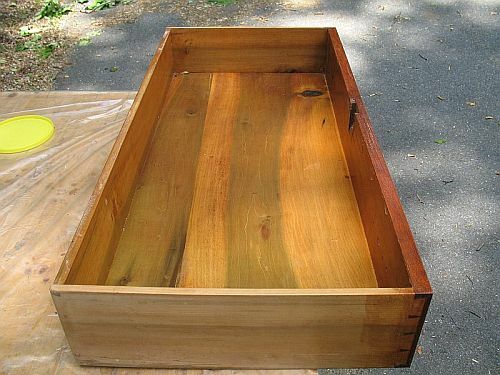 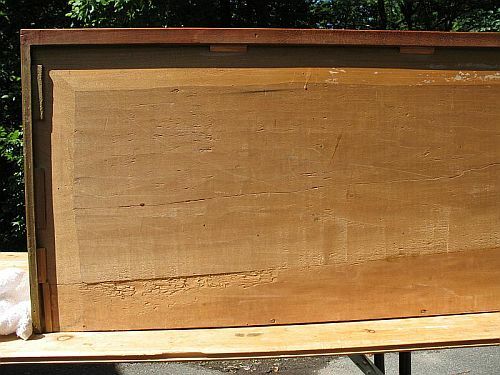 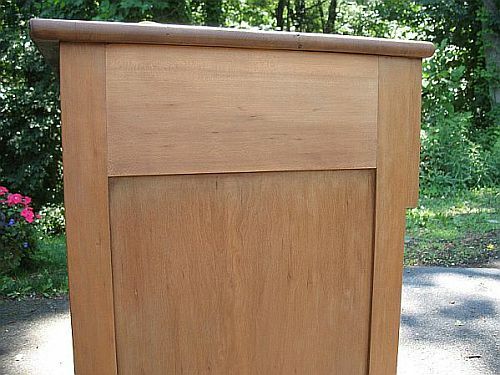 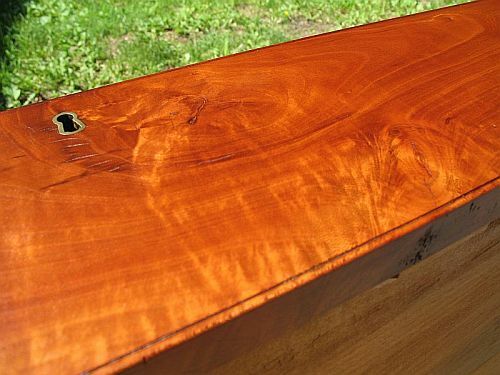 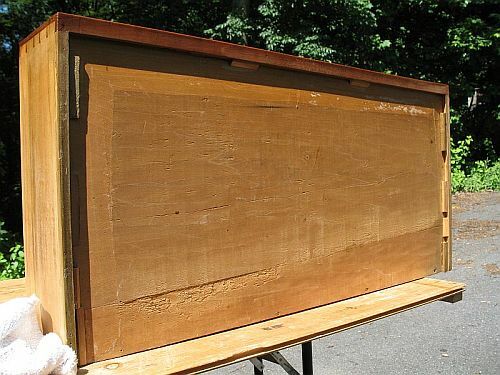 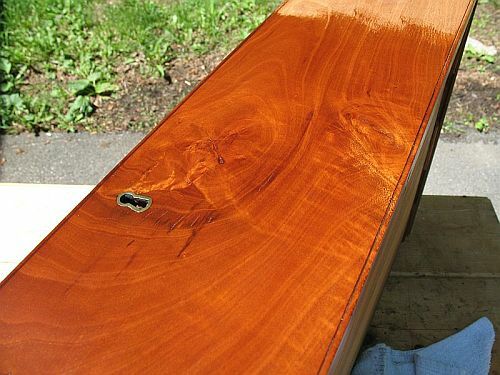 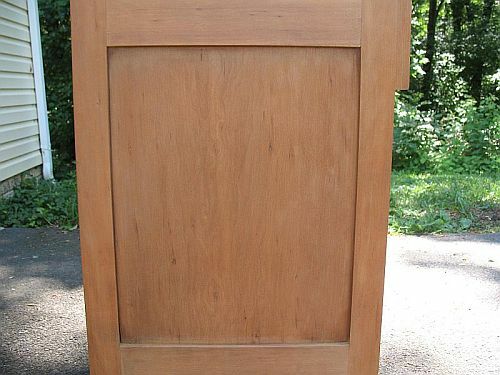 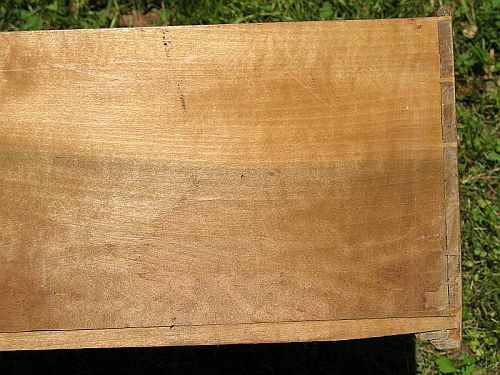 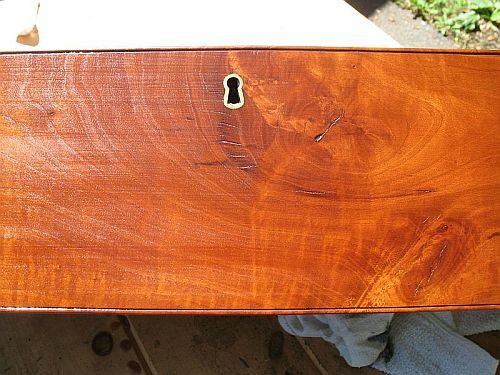 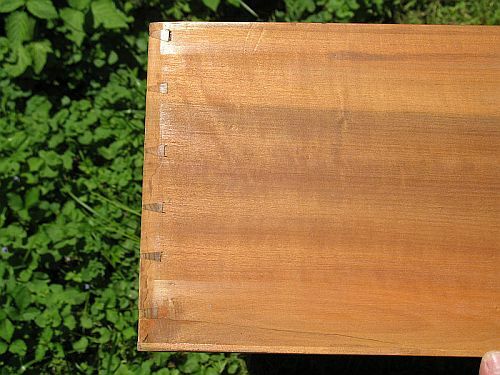 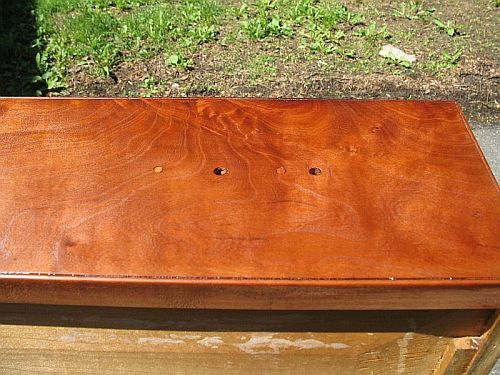 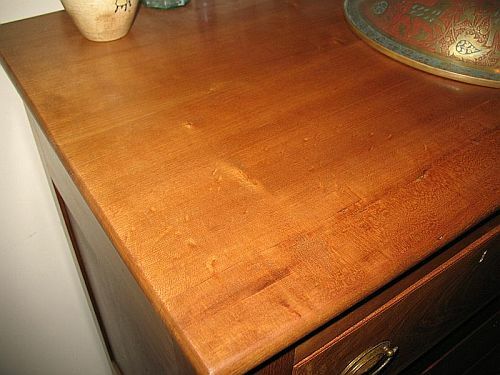 It took about 20 hours to strip all of the shellac and polyurethane from this chest of drawers, made of Cherry and with poplar as a secondary wood. 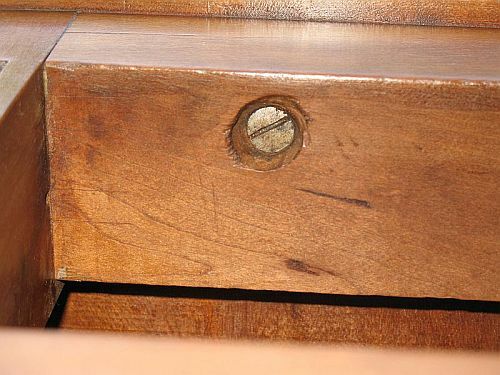 This chest can be dated to before 1820, owning to various details of it's construction,technique, and design. 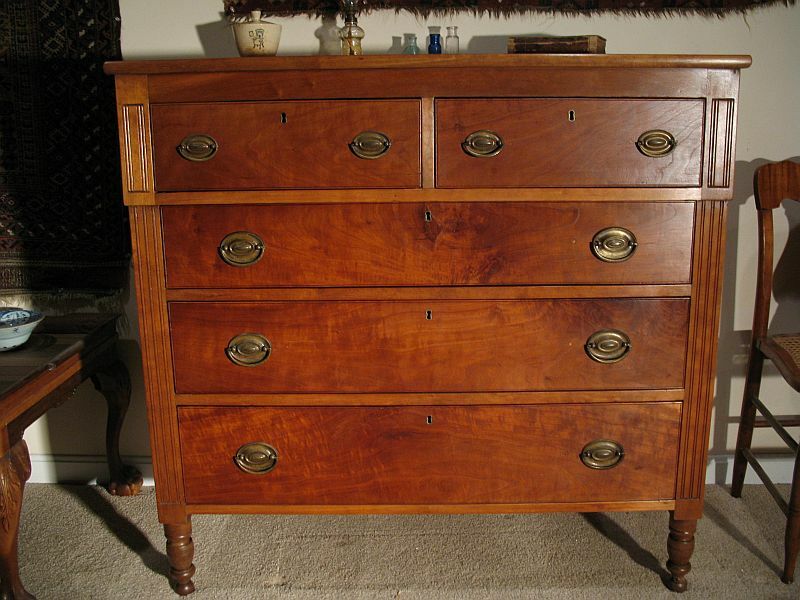 This chest is of provincial manufacture, as suggested by the simplicity of design and the execution of details. 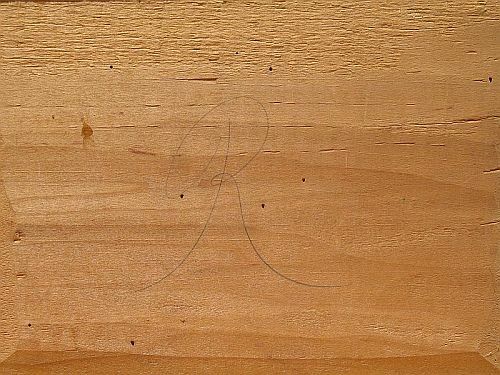 High examples of this time period are more effusive, and the bold yet simplistic execution of the reeding suggests a rural provenience. 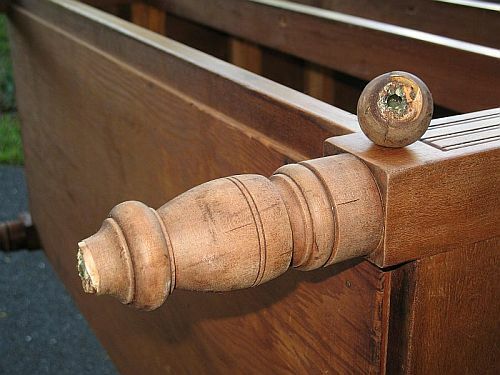 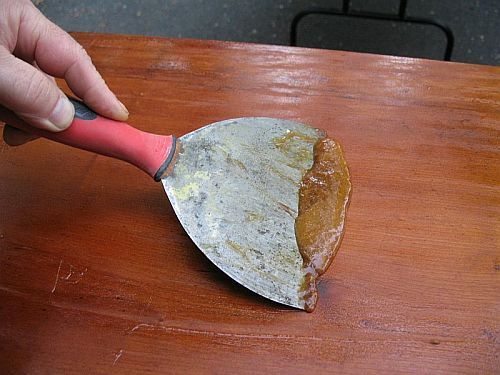 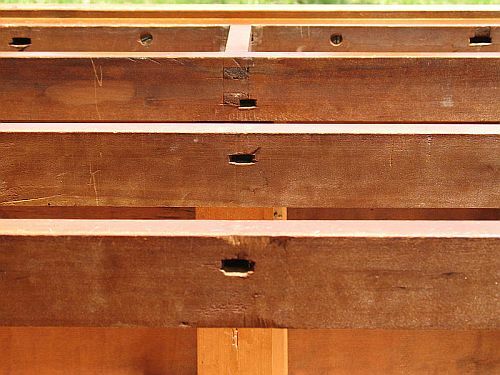 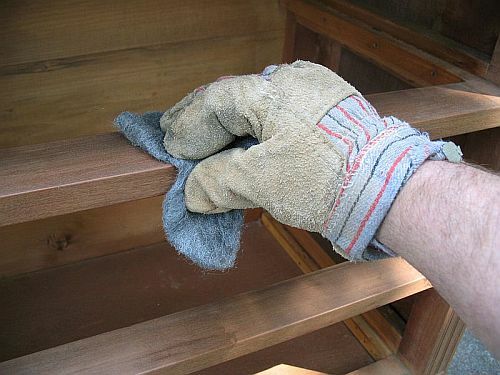 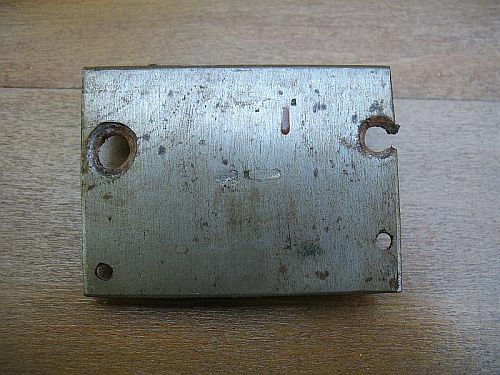 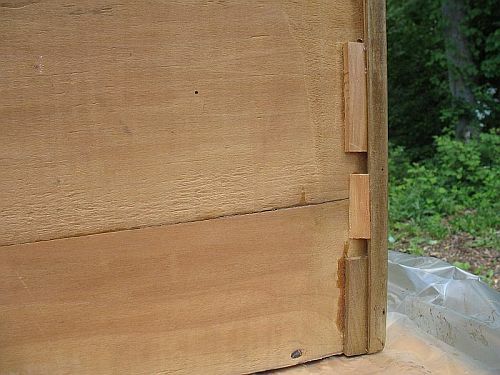 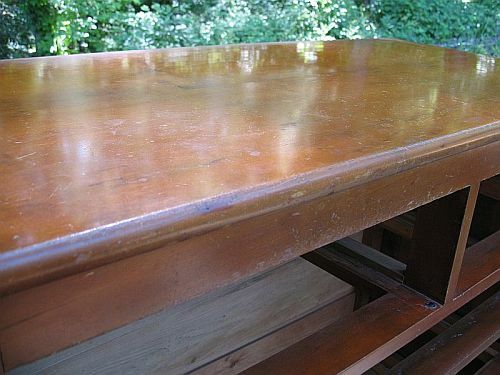 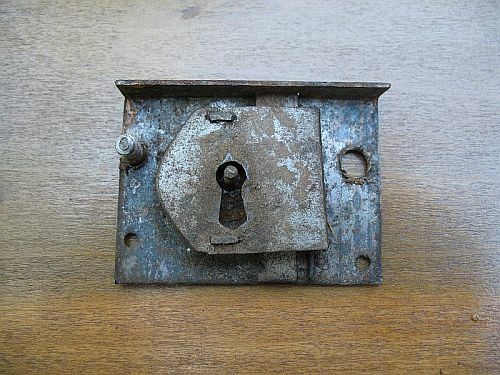 It probably would have had wooden pulls when new, as hardware was imported from Europe at the time and hence prohibitively expensive for a rural piece. 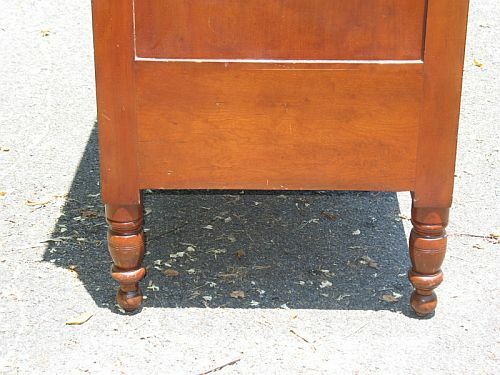 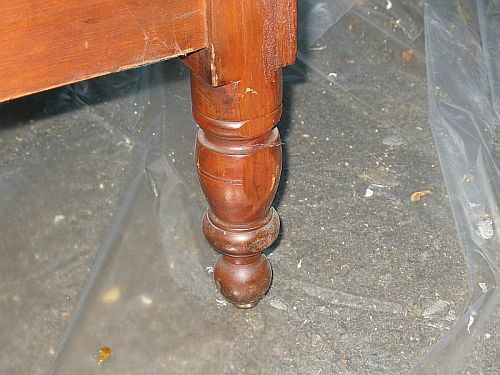 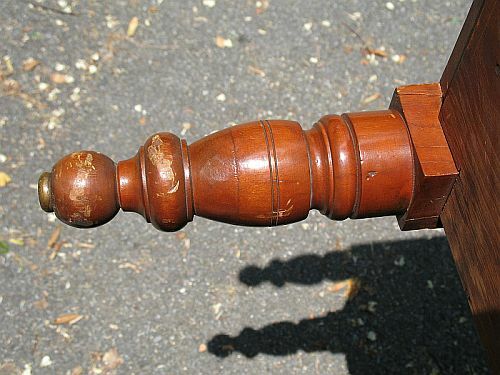 The casters are missing, as it was common for such fittings to be undersized for the weight of the case, especially in rural furniture, and hence are often damaged and discarded. 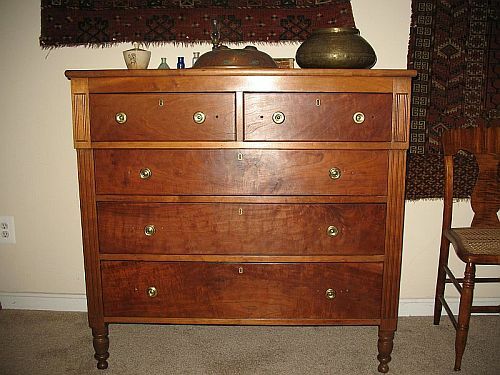 I confess that I passed this piece by on more than a few occasions before finally deciding to purchase. 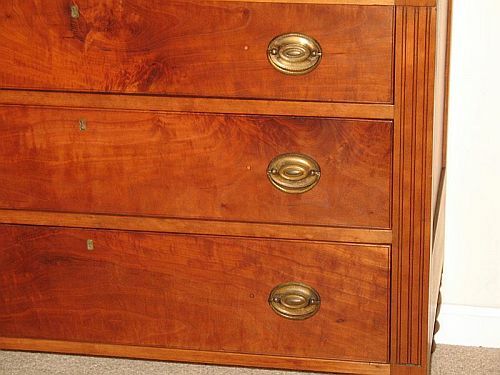 It was clearly labeled as a period Sheraton piece, but a couple of factors, owning to method of display and repairs and alterations, dissuaded purchase until a more thorough examination swayed my opinion. 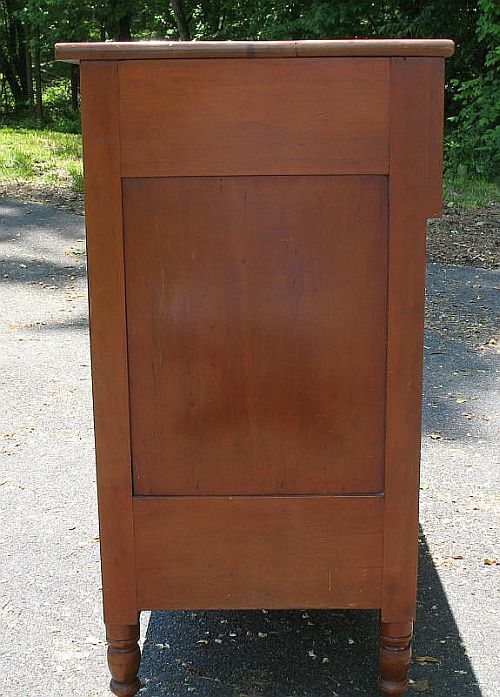 Having been once employed as a window dresser in the retail industry, and having learned first hand the importance of the proper display of merchandise, it comes as no surprise that this piece would have stood unsold in it's booth for years. 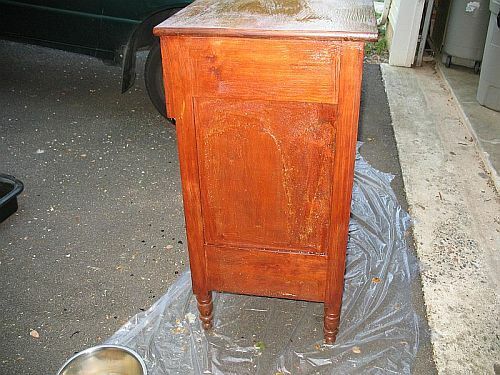 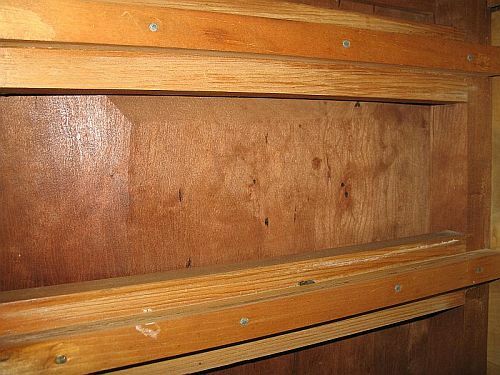 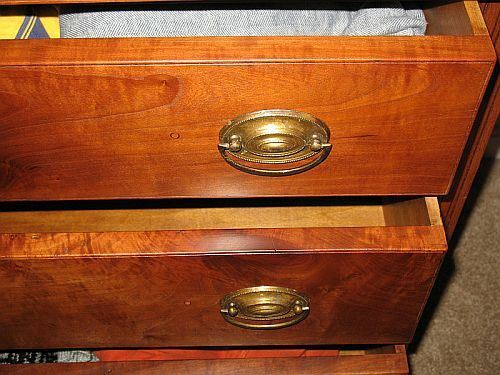 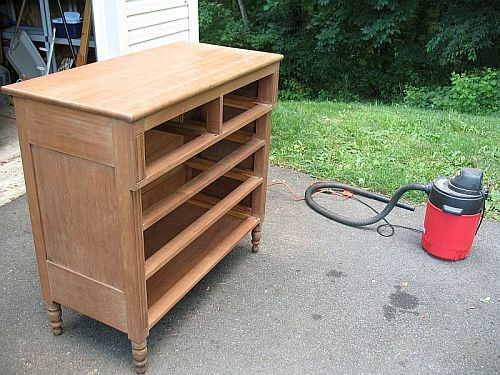 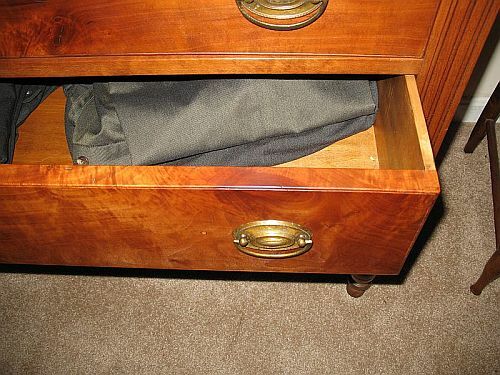 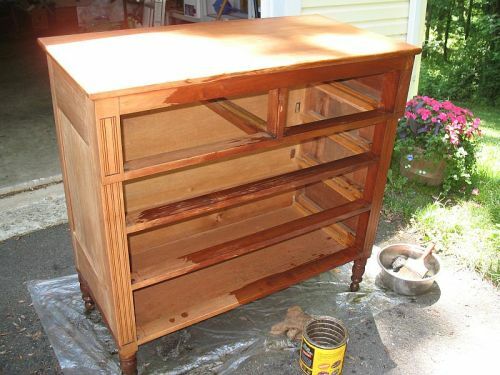 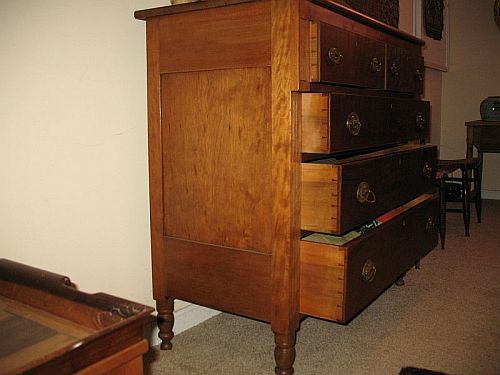 This chest was hidden from all sides by other furniture and the top was literally covered both by a fabric drop and a clutter of smalls. 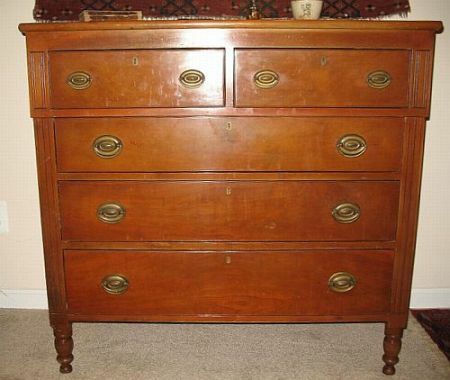 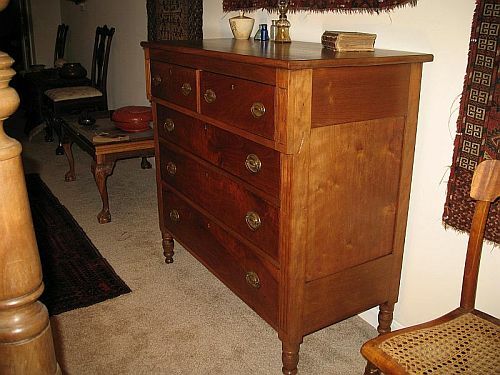 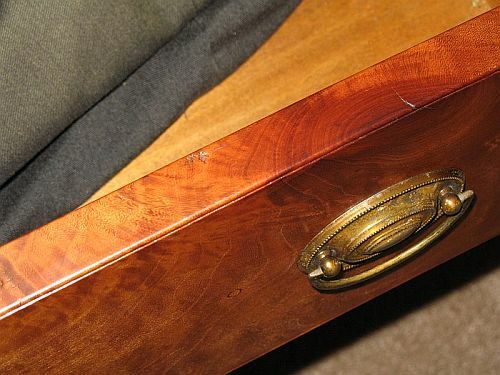 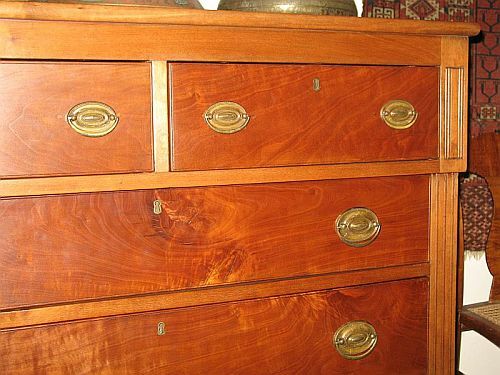 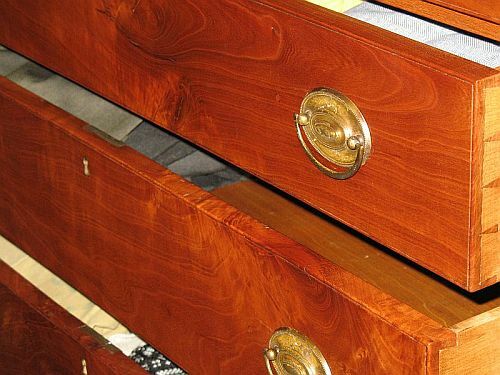 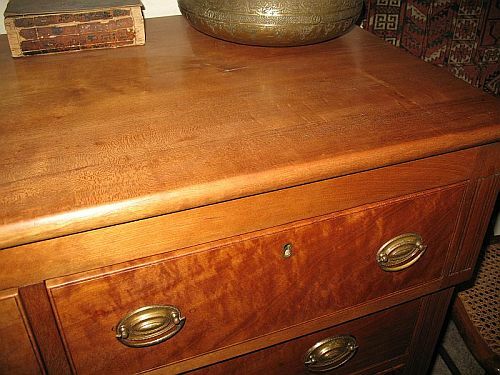 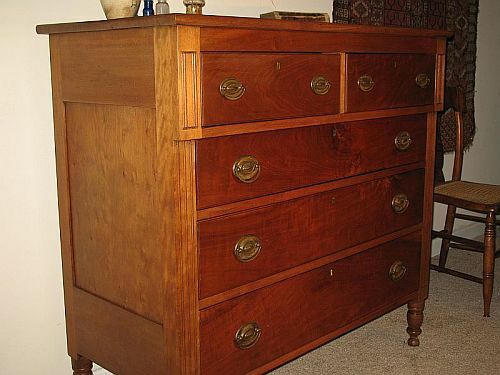 While chests of drawers from the Sheraton period are not rare, they are much more scarce than examples of the Empire period, which they can closely resemble, and exemplary pieces from the Sheraton/Hepplewhite periods are both rare and highly esteemed. 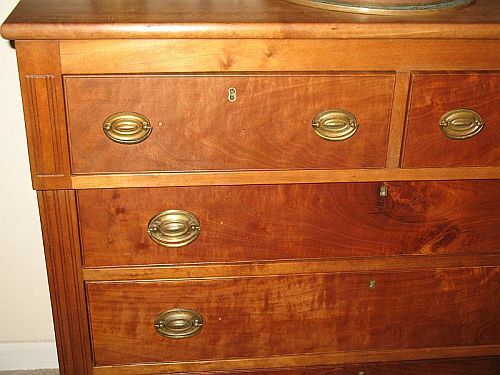 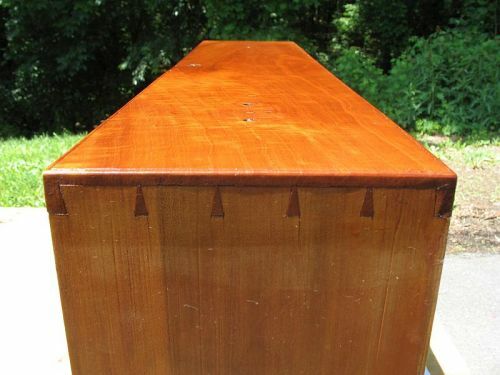 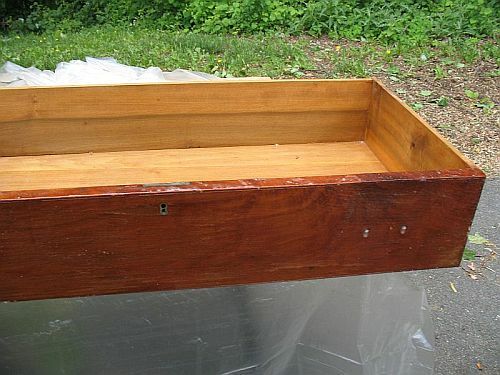 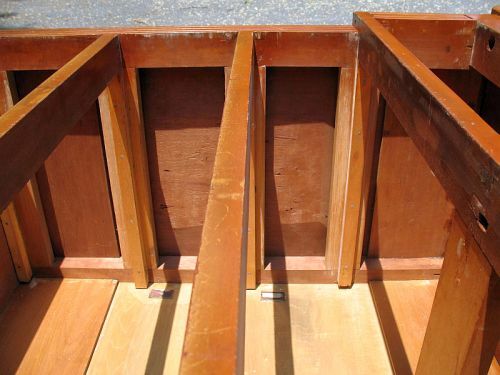 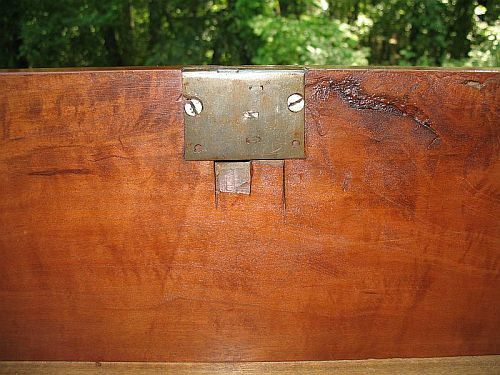 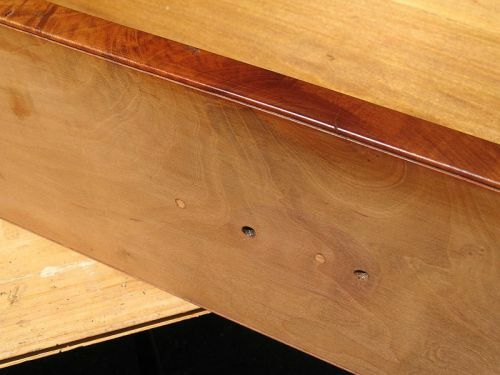 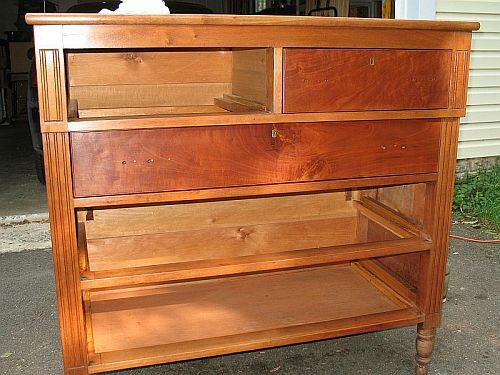 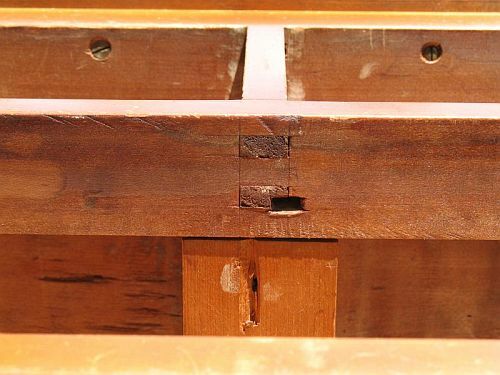 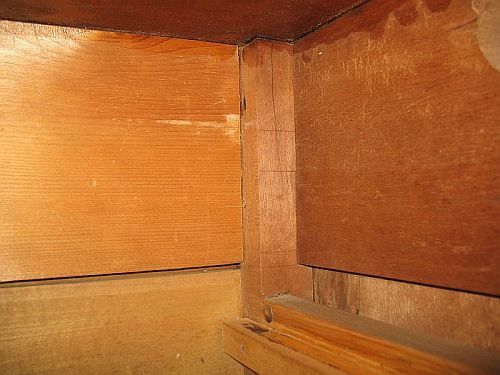 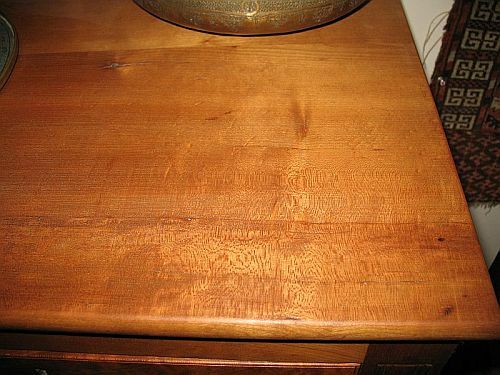 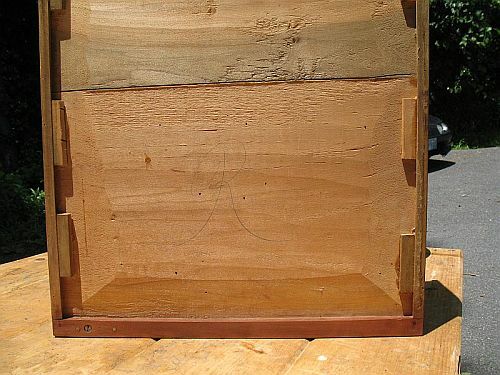 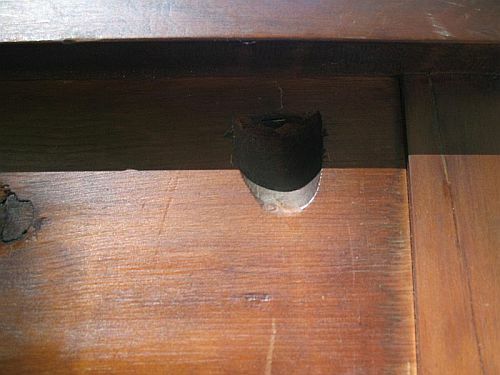 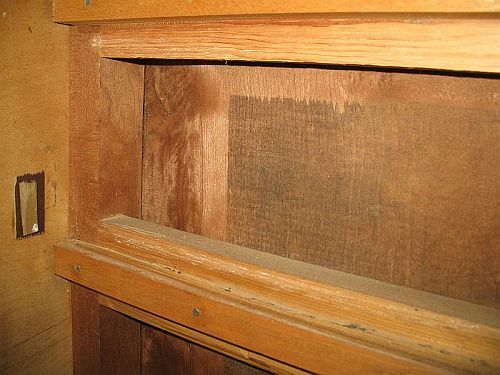 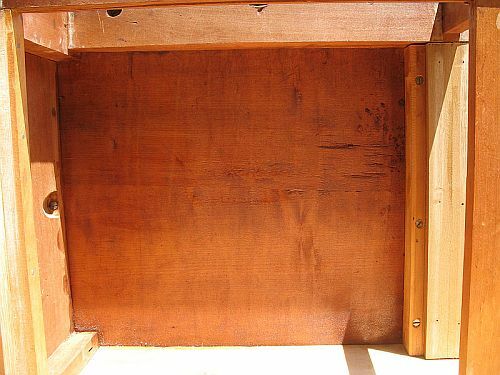 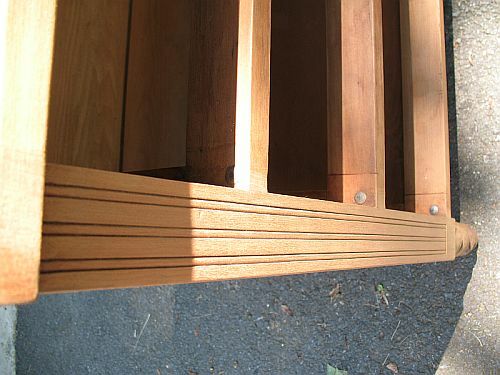 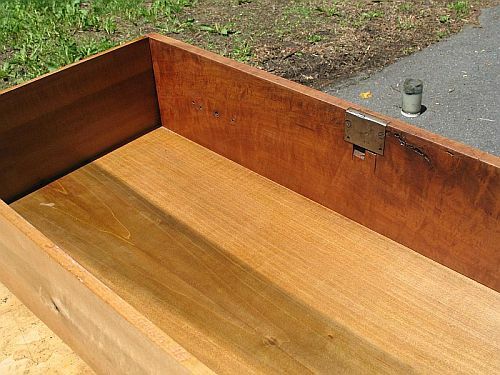 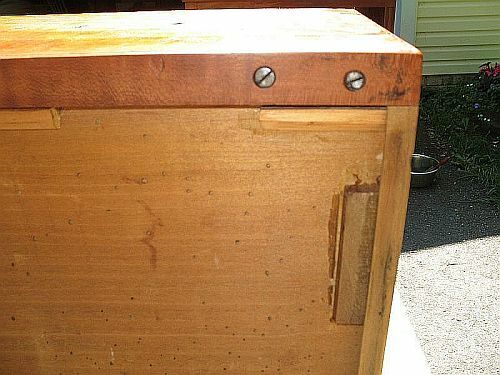 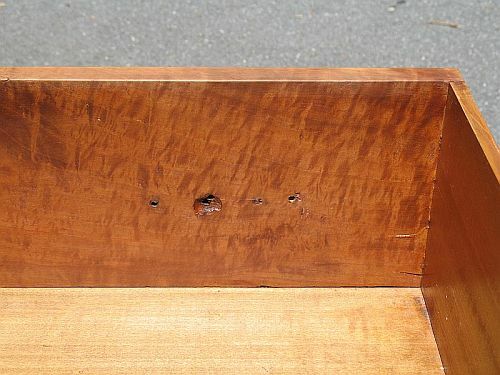 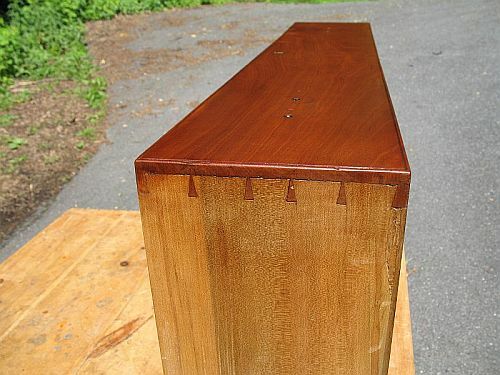 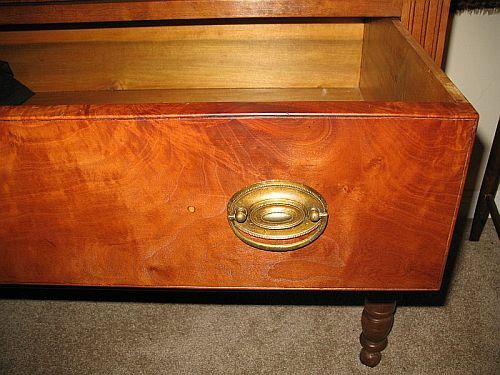 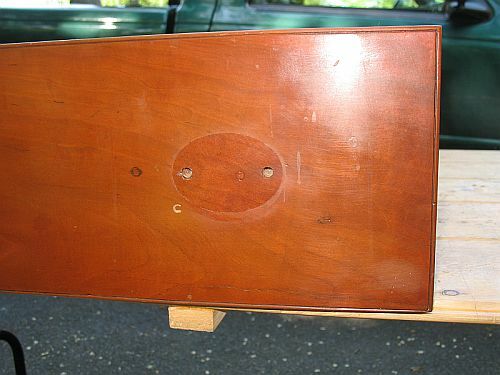 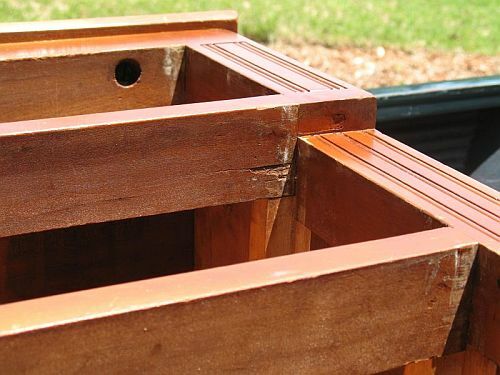 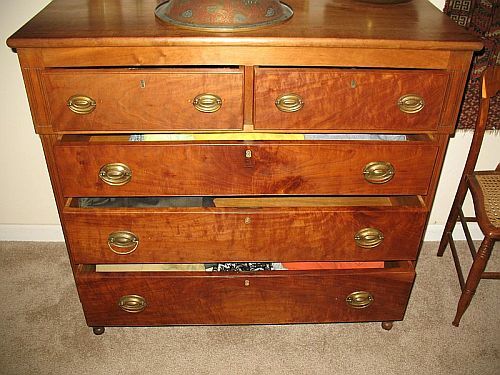 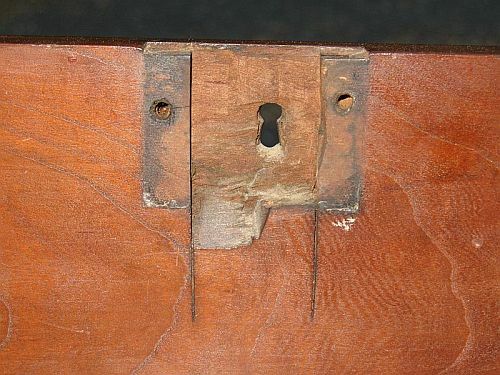 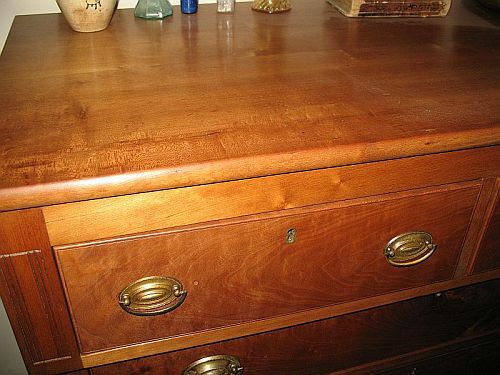 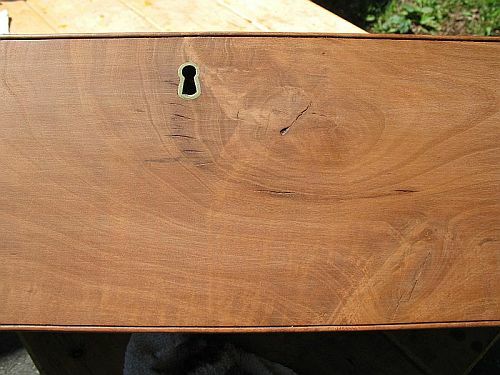 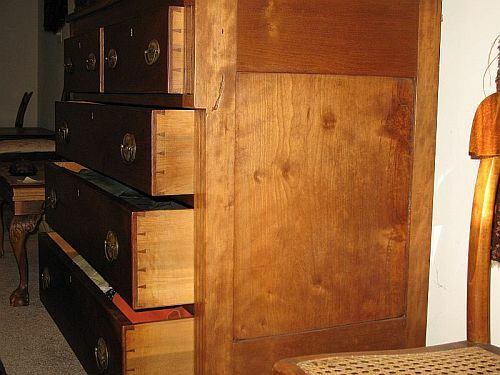 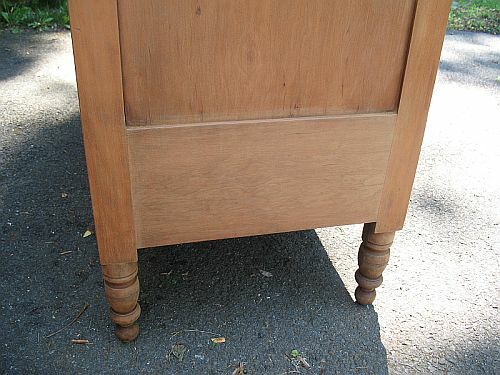 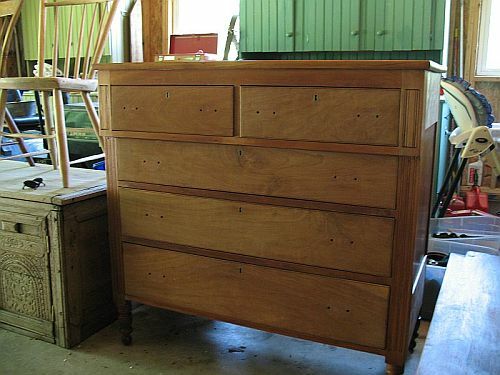 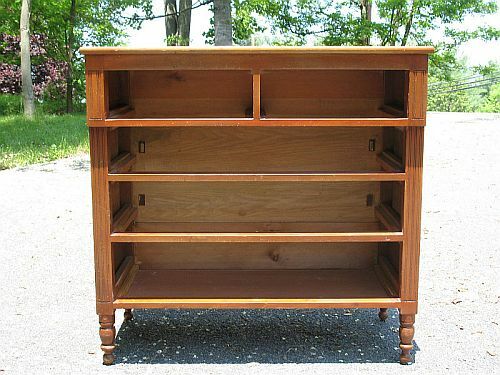 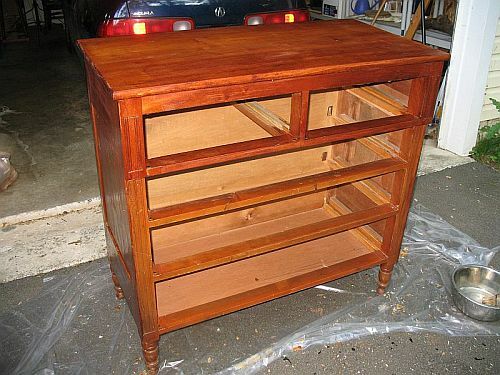 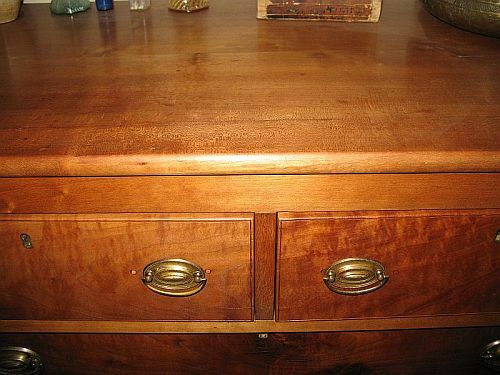 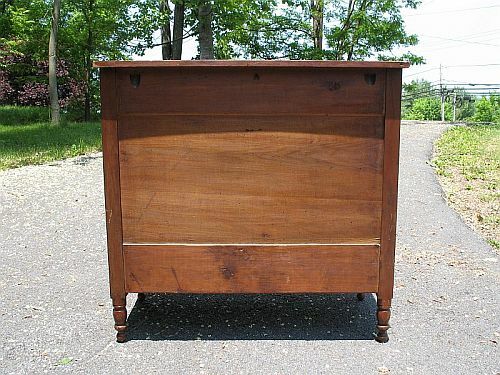 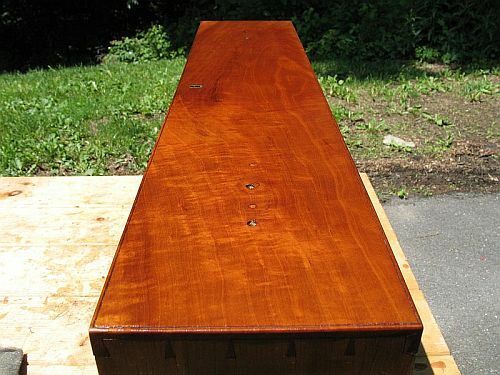 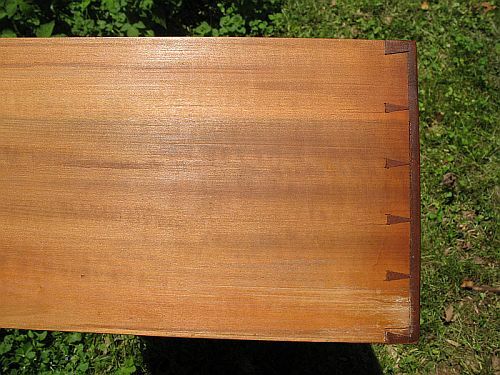 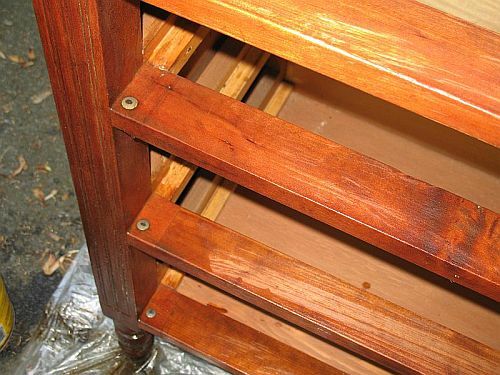 Ultimately, it was a variety of factors, including construction and execution of work, design and the manner and execution of repairs, and perhaps most importantly the delightful and intense cherry figure found in the selected materials (such as the interior of the drawer below), which persuaded me to buy.